Stuffed Brinjal curry is a famous dish and is cooked with special powder stuffed inside each brinjal. 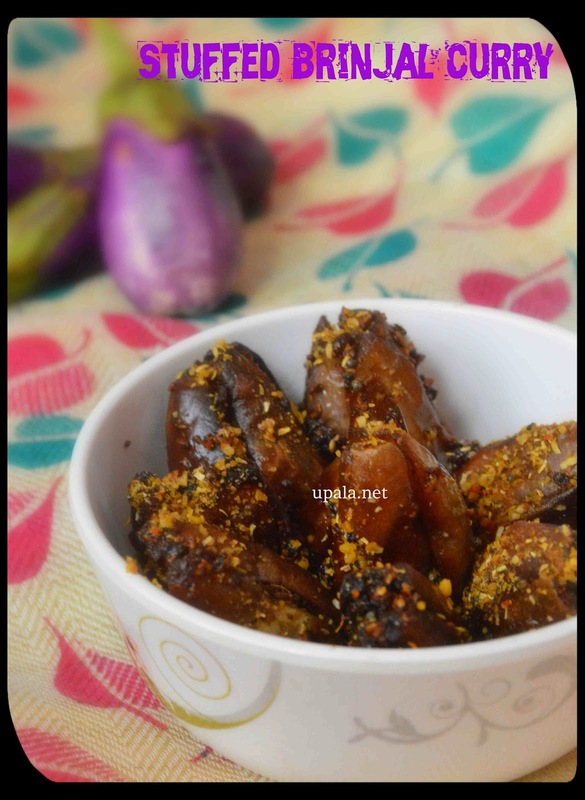 You can make this stuffed brinjal curry only with small brinjals and usually called as "Aathur kathrikkai".You might be wondering why we have to use only these varieties, here is the answer this kathrikkai has less seeds, less bitter taste and cooks fast. If you don't get this small variety of brinjals, don't worry you can cook it in a different way which tastes similar to this stuffed curry. Click here to get the recipe. 1) Heat a kadai and dry roast bengal gram, Urad dal and corriander seeds(one by one) separately. And transfer to a plate to cool down. 2) Add few drops of oil and roast asafoetida and transfer to same plate. 3) In the same kadai roast red chillies and trasfer to the same plate. 4) After it cools down, grind it to coarse powder with salt. 1) Wash and clean the brinjals. Wipe the brinjals with clean cloth to remove water. 2) Trim the green talk on the top of each brinjal. 3) Chopping is an important part in this curry, you have to slit them into four (not fully). Hold the bottom portion of each brinjal and slit it till mid way. Do this for all kathrikkais. 4) Take the ground podi/powder in a spoon and stuff it in the middle for all kathrikkais one by one. Keep them vertically in a bowl till you finish this stuffing for all brinjals. 2) After it splutters, keep the stuffed brinjals one by one vertically. Maintain low flame through out this process. 3) After you keep all the kathrikkais close it with a lid and continue to cook in low flame. 4) After few mins add tamarind paste and slowly mix. Need to be careful while mixing, as it might become mushy. 5) Let it cook slowly in oil, and after it cooks completely add few more podi and switch off the flame. 1) Adding oil gives great taste to this curry that is why I have given 1 cup full of oil. Make sure not to add water while cooking this kathrikkai as it will become mushy and will not taste good. 2) If your podi is in excess, you can store it in airtight container and use it for next time. 3) Adding tamarind paste will eliminate the slight bitter taste. 4) As we are adding salt in the stuffing podi, we are not adding separately while cooking. But if you feel you need more salt you can add at stage 4.